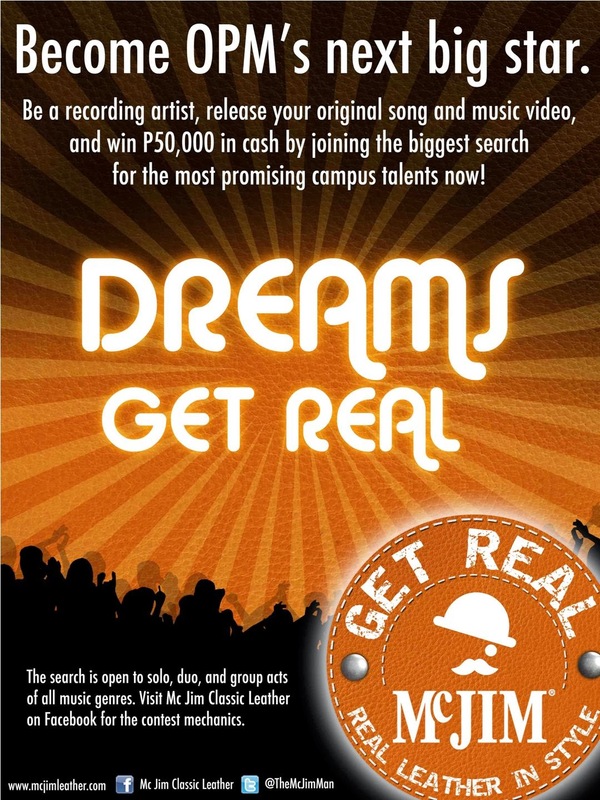 Home / boys / competition / contest / Dreams Get Real / manila / McJIM Classic Leather / opm / recording artist / singing / singing contest / Sonic State Studio / student / talent search / Ready to Make Those Dreams Get Real? Ready to Make Those Dreams Get Real? If you think you have what it takes to be the next star of Original Pilipino Music (OPM), and currently studying, come and join McJim Classic Leather on its search for the country's next recording artists, who will release his/her own single and music video, as well as win big cash prizes. Are you ready to make those Dreams Get Real? Open to all male college/university students ages 15 to 22 years old, whether solo, duo or group, “Dreams Get Real” is McJim Classic Leather latest project, which aims to make some boys' dream of becoming a recording a reality. Group acts must have a maximum of five members; they may also include female members but the majority must be male. All applicants to the contest must be of Filipino lineage and currently enrolled. Applicants must submit a demo compact disc recording of their performance of an original song plus a printed copy of the song’s lyrics along with the completed application form; a photocopy of their birth certificates; proof of current enrollment (i.e. valid ID or registration form); and one (1) colored picture saved in a CD. Failure to submit these documents and/or the CD recording and the printed lyrics will disqualify an applicant. “Dreams Get Real” accepts submissions of original songs in any style or genre. It is important that the submitted song is original and has not been previously published, released or distributed in any form. The original song must not have won any previous award too. The original song must also not infringe upon or violate a third party’s copyright or contain offensive lyrics. Applications may be submitted via email at ppresence@yahoo.com or via snail mail/ hand-carried at the Dream Get Real Secretariat, Unit 5 Metrosquare No. 23 Scout de Guia corner Scout Tuason, Barangay Laging Handa, Quezon City, Zip Code 1103. McJim Classic Leather representatives, the event organizer, and a panel of judges composed of respected personalities in the music industry, will review the songs and lyrics submitted, and evaluate the works. They will choose from among the applicants a total of 50 contestants who will compete in five weekly elimination rounds. McJim Classic Leather and the panel of judges have the right to disqualify any contestant whose work violates the contest rules or whose work does not meet the contest’s standards. After the elimination rounds, McJim Classic Leather and the judges will choose 12 semi-finalists based on the following: 1) Star quality; 2) Quality of the original song; 3) Voice quality; and 4) Audience impact. The 12 semi-finalists will be filmed performing their original songs live and these videos will be posted on the TV Get Real YouTube channel of McJim Classic Leather. From these 12 acts, six finalists will be chosen. Of the six finalists, three will be chosen based on the top three most viewed “Dreams Get Real” videos on the TV Get Real YouTube channel. The three most viewed videos will be chosen according to the number of views reflected by the channel’s counters by May 30, 2014 at exactly 12 noon. The remaining three finalists will be chosen by the contest organizer and the judges based on the degree by which they met the criteria. All six finalists will have the opportunity to professionally record their original songs under the Sonic State Studio (the arranger and recording studio behind OPM artists Gloc 9, Abra, Orange and Lemons, Kamikaze, Silent Sanctuary, and 1:43, to name a few). The songs will be released as singles in radio stations nationwide. By June 15, 2014, all six finalists will compete for the championship. The judges, the event organizer, and McJim Classic Leather will deliberate on the six finalists’ over-all performance and potential as commercially-viable recording artists. From this set of finalists, the grand winner, the second place winner, and third place winner will be chosen. The decision of the judges, the organizer, and McJim Classic Leather is final. The Grand Winner will receive prizes of Php50,000 in cash, a recording and management contract, and a grant to create the official music video of a single. The second placer will win Php25,000 in cash and a trophy. The third placer will win Php15,000 in cash and a trophy. All the 12 semi-finalists will receive Php10,000 worth of McJim Classic Leather products. So start practicing and get ready to join “Dreams Get Real” by McJim Classic Leather - who knows, this just might be your ticket to musical stardom. For the the complete set of contest mechanics and rules, do check out Official FB Page of McJim Classic Leather. Thank you and good luck, boys!